First-Year Applicants are students who’ve never attended a college or university. 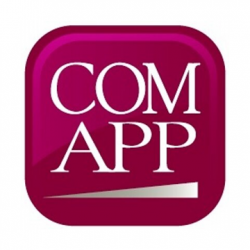 The Common Application is an easy-to-use college application system. You’ll need to provide some basic information about yourself and your family; and some more detailed information about your education and your extracurricular activities. You’ll also be asked to write a 500-650 word essay. The Stonehill Member Screen question gives us a few more details that are not included in the main section of the Common Application. 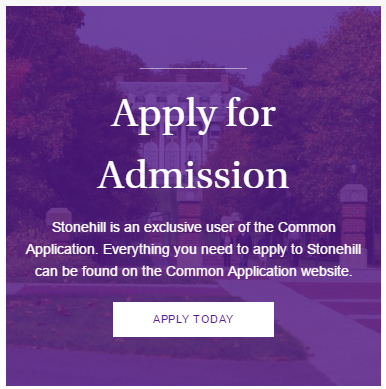 After adding Stonehill to your list of colleges through the college search function of the Common Application, you will be able to answer the Stonehill questions. Stonehill does not have a separate writing supplement, but the Member Screen does contain an optional writing question. Students have many choices in their college search and application process. Please share why you have chosen to consider Stonehill among your possible college options. Students in Stonehill College’s Moreau Honors Program form lasting habits of reflection, assessment and discernment through intellectual engagement, service learning, community involvement and team building. An active and close-knit community, highly motivated to succeed in matters of both the mind and heart, Moreau Honors students take control over their learning as they uncover new interests and develop new skills. If you are interested in being considered for the Moreau Honors Program, please select yes and complete the required essay below. Your official High School Transcript will need to be submitted by your guidance counselor as part of your application. Your transcript should show your cumulative grade point average (GPA) and your class rank (if your school calculates one). We attract applicants from all over the country – and all over the world. The Secondary School Report helps us get to know your high school a bit better. The report asks questions about the classes you’ve been given the opportunity to take, the size of your graduating class, and how your GPA has been calculated. The Secondary School Report Form is included in the online Common Application and should be completed by your guidance counselor, who will also attach their letter of recommendation. Teacher Evaluations help us get to know you from a different perspective. The evaluation form will ask your teacher to provide insights into your intellectual promise, creative thought, leadership, integrity, and self-confidence. Ask for evaluations from teachers who know you well, and be sure to ask far enough in advance for them to thoughtfully consider your time together. We require that you provide at least one Teacher Evaluation. Teacher Evaluation Forms are included in the online Common Application. The Midyear Report should be submitted when your grade 12 midyear or first trimester grades are available. Your guidance counselor should also submit an updated official High School Transcript at that time, including courses in progress. Remember: grade 12 first quarter grades are required and must be submitted as soon as they become available. prior to the Midyear Report and Final Report. The Midyear Report Form is included in the online Common Application. The Final Report should be submitted when your grade 12 final grades are available. Your guidance counselor should also submit an updated official High School Transcript. The Final Report Form is included in the online Common Application. You may need or want to submit other supplemental forms along with your application. Early Decision applicants must submit the Early Decision Agreement form. Supplemental forms are available on the Common Application website. Eligible students may be able to receive a fee waiver from their guidance counselor. Standardized test scores are not required for admission to Stonehill, but we’ll review them as part of your application if you feel as though they serve as validation of your readiness for college. We will only review the highest test scores submitted with your application – simply request that your SAT (Code 3770) or ACT (Code 1918) score be sent to Stonehill prior to the application deadline.